Strong practice acknowledges that all of our educational choices build community and engagement or, conversely, tear it down. See how Story Studios is building community as a strong literacy approach. Using the Story Studio Framework of Inspire-Create-Share, teachers are connecting learners to experiences in nearby, outdoor places and/or prior learning experiences to engage learners in their own learning through story. Last year, Delta created two Story Studios. A team of teachers (including myself) created these spaces to merge Reggio inspired approaches with place-based learning and a literacy framework known as Story Workshop (MacKay, 2013). During the year, Story Studio grew to be both a place in a school and a framework for learning. Story Studios are cozy and inspiring spaces filled with books, puppets, art supplies, place-based toys and various materials from the local environment, dollar stores and thrift stores. The Story Studio framework involves teachers and learners in a three-part sequence to share the learning: Inspire, Create, Share. Last year, Story Studios improved the way educators and students learned and shared their learning. What is a Story Studio? Story Studios in Delta are magical places, rooms in schools where the aesthetic beauty and calmness of the room embrace everyone who visits. Soft lighting, a variety of sitting and standing spaces, beautiful and playful materials, accessible art supplies, and beautiful books greet students in the space, inspiring the learners to share their stories. 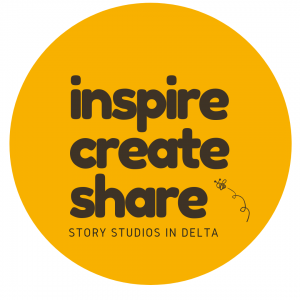 Story Studio is also a learning cycle: Inspire – Create – Share. This framework is used to connect experiences in nearby, outdoor places or prior learning experiences to creating a learning story. This framework helps deepen thinking and learning. INSPIRE: Students experience the indoor and outdoor places through exploration and discovery. Learning is hands-on and stories are woven throughout the exploration. Students listen to stories told or read to them by their teacher. The stories connect either specifically to the past and present of the place, to curricula, or to a relevant big idea. Sometimes a story is the inspiration, sometimes previously created stories by the student will inspire, sometimes a science or math lesson will inspire. Often it is a combination of many experiences and opportunities that when remembered and reflected upon become inspiration. For example, the stories might be about a farm, or water cycles, or ideas of power. CREATE: In this phase students author stories using loose parts, story materials and art supplies. Students create learning stories playfully by creating the setting, or where their learning is situated, then adding details from their observations, memories and stories learned, finally they play out the story by physically moving the pieces of the story and playing the story. Loose parts (Daly, 2015), are anything learners can play with, manipulate and create. They can be realistic (plastic animals or trees), natural (shells, rocks or pinecones), or found in abundance at the dollar store and art supply cupboards (gems, marbles, ribbons, pipe cleaners, felt mats.) Story materials include larger play pieces, wooden blocks, peg people, puzzle pieces, puppets and art supplies. Using items to hold meaning reduces the cognitive load for students as they are creating their stories. The materials act as prompts when orally sharing or writing to remind authors of key parts of their stories. The creation of stories in this way acts as brainstorming and initial drafts in a playful and engaging, rich way. SHARE: In this phase, students share their stories orally with peers and adults in the room. Often adults record these stories through videos and photographs or by transcribing stories for students. Students also share their stories in writing, through photographs, through created pictures, paintings, sculptures, and story mats. Often the learning is documented by the teacher using photos and words to capture the process of meaning-making. The Inspire – Create – Share learning cycle affords students the opportunity to transform facts, stories, and teachings into their own story. Through playing and replaying, this process of meaning making becomes their own learning, authentic and embedded in their experiences. The revised BC Curriculum’s spaciousness inspired more cross-curricular learning. The First Peoples Principles of Learning inspired reflection on how story is an integral part of learning. The Reggio-Inspired approach from schools in Reggio-Emilia, Italy inspired student-centred, hands on learning. Opal School in Portland, Oregon inspired the use of the literacy framework, Story Workshop to invite the arts into the expression of ideas in writing. Colleagues from the Richmond School District inspired us with their ingenuity in finding an unused space in a school and transforming it into a learning oasis. The OECD 7 Principles of Learning provided a framework for creating story studios and for ensuring that we were creating a space to optimize learning and facilitate the sharing of learning. The Spiral of Inquiry shaped and facilitated our inquiry stance. Colleagues in Delta, including Kelli Lundie, Alana Tesan and Leila Waugh, playing with these concepts and finding success, inspired us to weave them together to create Story Studios. Finally, we were inspired by the richness and beauty of the physical spaces near our schools. The new curriculum states that we must change our “education system to one that better engages students in their own learning and fosters the skills and competencies students will need to succeed. One focus for this transformation is a curriculum that enables and supports increasingly personalized learning, through quality teaching and learning, flexibility and choice, and high standards” (Government of BC, 2018a). “Language and story can be a source of creativity and joy” (Government of BC, 2018b). “Stories and other texts help us learn about ourselves, our families, and our communities” (Government of BC, 2018b). From the First Peoples Principles of Learning we know that “learning is embedded in memory, history, and story” (FPPL, 2014). Stories connect us to each other and to the places around us in a powerful way. When we transform our learning into story it becomes part of who we are, and is then something we can share with others. Stories make our learning portable and transferable. The FPPL also reminds us that “Learning takes patience and time” (2014). Devoting a day or several days of school for seasonal visits to a studio is an invaluable investment of time. Allowing students to playfully create learning stories takes time away from other activities. Diving deeper into learning takes patience and time and the results are well worth it. The Reggio Emilia approach from Italy of sees children as capable learners who have the right to make choices about their learning and to work in relationship with others (Reggio Children, 2018). In Reggio-Inspired practice the environment is the third teacher and materials are set up to be accessible and inspiring. Children are seen to have a multiple ways of learning and showing their understanding. Loris Malaguzzi refers to this as “the hundred languages of children” (Reggio Children, 2018) meaning that children have a hundred ways of learning, exploring and sharing their understanding. Invitations for learning are created when different materials are offered to students. Provocations are created as a response to what the students do with the invitations. Sometimes students are invited to explore using their senses in the forest, then in the studio students will be invited or provoked to deepen their learning by creating a story using self-chosen parts or parts carefully chosen by the educator to deepen learning and understanding. Educators at Opal School in Portland, Oregon created the literacy framework Story Workshop. Story Workshop grew out of an inquiry around how the arts might enhance the Writers’ Workshop framework (MacKay, 2013). The perspectives and the stories of the child are honoured at Opal where learners inquire deeply and educators document the powerful learning of the group and the individuals. Through documentation (mostly photographing, videotaping, and transcribing) of the process of learning, educators emphasize learning as a process rather than a product. Marie Thom and Janice Novakowski, in Richmond, BC, created a Studio at Grauer Elementary to explore the intersections between mathematics, science and the arts. The space, once an empty classroom used for storage, is now shared with classes from Grauer and from throughout the Richmond School District. Marie and Janice hold workshops and events in the space to share it with an audience beyond their district. The 7 Principles of Learning (Dumont, Instance and Benavides, 2012) outlined by the OECD provided a framework to guide the creation of curriculum at the Story Studios. “Emotions are the gatekeeper to learning” inspired us to create warm, welcoming spaces where children will find choice and opportunity to find themselves and their learning in the variety of books, learning spaces and materials offered. “Recognizing individual differences” connects nicely to the Reggio-Inspired Approach of the Hundred Languages of Children. The position in Story Studios is that all children have a story and that there are multiple ways to share it during a visit to the studio. “Challenging all students” connects to the multiple opportunities for learning and sharing learning offered within the Story Studio framework and physical spaces. Students are stretched to learn in new environments and through different modalities. “Meaningful feedback for learning” is connected to the Reggio-Inspired approach of creating invitations and provocations for learning. This approach supports the nudging of students towards learning intentions or targets shared with students at the beginning of the session. Regular targets used in Story Studios are: I can make use of my senses to make scientific and artistic observations, and I can transform my observations into the settings and details of my story. Documentation of learning and feedback to students to nudge their learning stories to include more details, or share more learning are modelled throughout the visits. The creation of Story Studios, and their expansion through year, was framed through a Spiral of Inquiry (Halbert & Kaser, 2013). Moving through the Spiral to scan, focus, develop a hunch, learn, take action and then check our impact shaped the development of the Studios. The Spiral highlighted the need for Story Studios in Delta and made it clear when Story Studios needed to expand. This year we are checking to see if we have made enough of a difference. We will check into the impact of story studios on student literacy through anecdotal reports as well as evidence in writing samples and formal written reports on individual students from teachers (we used to call them report cards – now we call them Communications of Student Learning). What Is the Impact of Story Studios? The impacts we have observed are based in data from our first year in operation during which 1700 students over 150 visits learned and created stories in our Delta’s two Story Studios. of the 24 elementary schools in Delta, 19 schools have visited the Hive. Most visits have been by primary classrooms. All teachers also observed increased literacy success for their students. After learning with her students at The Hive, one teacher commented that “kids need time to explore and create story. It’s not just a matter of sitting down and writing” (D’Aoust, Story Studio Visit Survey, 2018). 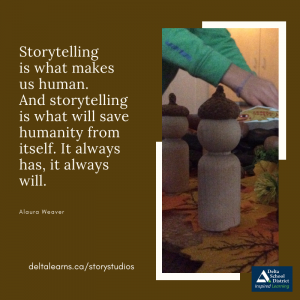 In Delta, teachers are transforming their practice through both the place and the framework of Story Studio. There have been tears of relief and amazement when, for the first time in a career, a method of inspiring writing is met with cheers instead of groans. Students are eager to create their stories and then after time to explore, play and share they are ready to write, type or record them orally. weave in indigenous stories and ways of learning. What about intermediate teachers? One of our initial Story Studios, The Forest, was located within a populated school. From this design feature we observed higher use by intermediate students. This data makes us optimistic that with the spread of Story Studios into more schools in the 2017-2018 year we will have more use by our intermediate classes. When Teacher Coordinators have worked with intermediate teachers to highlight the benefits of Story Studio they have become more interested in using it. Primary teachers are inviting their intermediate buddy classes to partake in Story Studio. During the 2017-18 school year, interest around Story Studios grew quickly. Educators, having experienced success with their students wanted Studios at their own sites. During the year four schools began creating their own studios with Parent Advisory Council and school funding. Due to this interest, the Delta School District offered funding to school teams, who applied and attended a visioning session, to create their own Story Studios. By the Fall of 2018, fourteen Delta sites will have Story Studios or mobile studios in place. Each school is bringing their own flavour to the framework by naming their space and choosing materials that resonate with the culture of the school. All schools are preparing their spaces and materials to be shared with their entire school population. Visitors from other districts in BC as well as international visitors from England and Australia have visited the Hive and the Forest. Colleagues in Campbell River and Vancouver have visited our spaces and have now created Studios at schools in their districts. In North Vancouver, educators from one school are learning how to integrate Story Workshop throughout their primary divisions and are considering a studio. We have heard that a Story Studio may pop up in Sydney, Australia. The interest in engaging learners through Story Studio and introducing funded Studios filled with supplies is growing. The spread of Story Studios as a physical space AND as a framework reinforces the fact that holistic hands on learning is good for all learners. Experiencing learning holistically has helped learners understand that literacy happens everywhere in the world. Strong practice acknowledges that all of our educational choices build community and engagement or, conversely, tear it down. After her visit to The Hive a teacher shared the following: “We remembered how important it is for us to give our students rich experiences like this. They enjoyed it so much. One student said to me, ‘this is the best field trip ever’. Going to the Hive in the first term helped bring us together as a learning community. We plan to return in June to celebrate our year together” (D’Aoust, Story Studio Visit Survey, 2018). Language learners experience great success through access to materials and manipulatives to support the sharing of their stories. One Kindergarten French Immersion teacher shared, “Our two field trips to The Hive have been the most incredible learning opportunities for my students! Their questioning has deepened, their “Je me demande” thoughts have expanded!” (D’Aoust, Story Studio Visit Survey, 2018)/ This supported learning is important for all students, regardless of age. After visiting the Hive on a Core French pen-pal field trip, a grade 7 student said, with a huge grin, “I can’t believe how much French I used and learned today” (D’Aoust, Story Studio Visit Survey, 2018). As we continue this journey we are excited to see where our stories take us next year when Story Studios grow throughout the district. We are excited to see the improvement in students’ writing that will come with increased access to story manipulatives. The hope is that more teachers will offer materials as part of their repertoire in supporting students in the writing process. Tracking impact of the studios on student literacy will become a stronger focus next year through student writing samples and communications of student learning to parents. We are building a community of storytellers and writers. Educators are sharing the learning of their students through class books, documentation panels, tweets, padlets and emails and inspiring each other with their stories of learning. 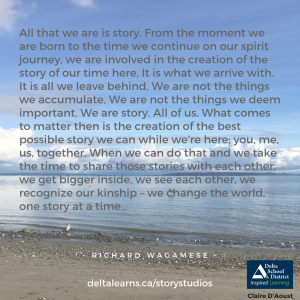 In Delta, we are learning, sharing and storytelling together. To learn more about our story visit https://deltalearns.ca/storystudios/ or follow #storystudio37. Claire D'Aoust is the Coordinator of Primary Learning in the Delta School District. 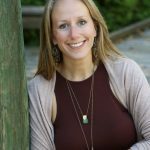 She supports teachers and students in elementary schools with a focus on literacy grades 1-5. D’Aoust, C. (2018) [Story Studio Visit Survey]. Unpublished raw data. Wagamese, R. (2014) Medicine Walk, McClelland & Stewart, Canada. A beautifully written and supremely informative article. Thank you for telling the story and offering so many opportunities for further exploration. I look forward to sharing this piece widely, and seeing what seeds are planted. The Hive… one of my most favourite places to take my Ks! We love it there! Climbing trees, making sea kelp pulleys, drift wood levers, irrigation systems, pulling weeds, creating and telling stories with loose parts… They are always asking when we’re going back! Well done Claire! I read this through tears.